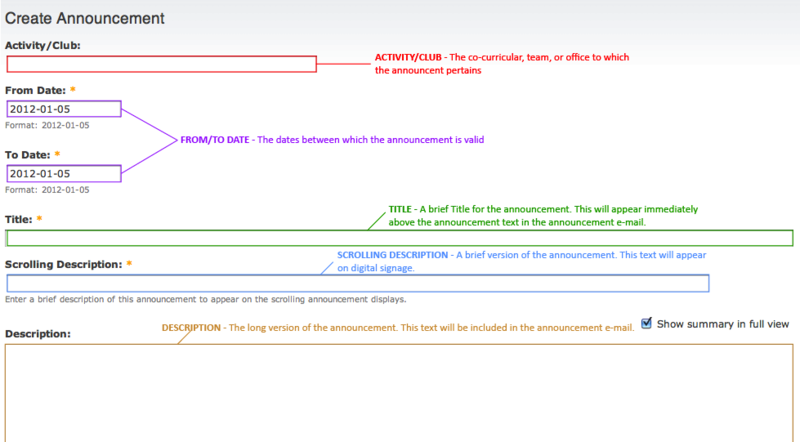 This document describes how to submit an announcement for publication in the daily Announcements e-mail, as well as on the digital signage. 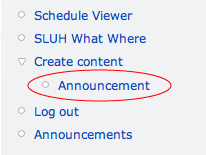 Navigate to support.sluh.org and log in by clicking the Login link in the upper-right corner. This login uses your e-mail credentials. Once logged in, click "Announcement" in the right-hand menu under the menu item "Create content". Only the dates, Title, and Scrolling Description are required, but the Activity/Club and Description will help make your announcement as complete/thorough as possible. Click Save when done, and the announcement will be submitted for approval. Once approved, the announcement will be added to the announcement e-mail and the digital signage. To see whether your announcement(s) have been approved, simply click the "Announcements" link in the right-hand menu and check for your announcement. Note: the Announcements display only displays current announcements. If your announcement is scheduled to begin at a future date, it will not show up until that date.